GQ says: Don’t be a mook, get a pinkie ring. Chances are your dad’s dad’s dad had a signet ring with his initials or family crest on it. He may have even dipped his in wax and stamped his mail with it—that’s what the flat top was for. Then the signet ring became a mafioso staple. Now, finally, it’s got a sense of humor. Like all the other men’s jewelry that’s come back in style, the new signets are masculine but self-aware—less likely to sport your monogram, more likely to drop an F-bomb. Find one that fits your personality and do your best to refrain from asking folks to kiss the ring. Q: I am thinking about getting into jewelry and am considering purchasing a pinkie ring. 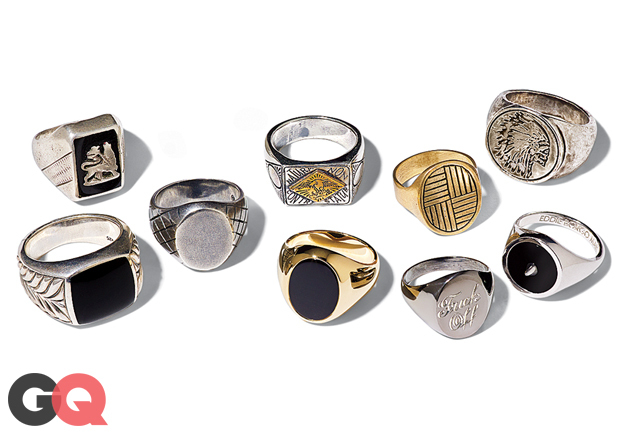 I’ve seen rappers wear them, and though I don’t want to look like them, I think the rings are pretty cool. What’s your opinion? A: Generally, I consider wearing a pinkie ring to be in roughly the same category as growing one fingernail long to prove that you don’t work with your hands; i.e., you are a pimp, a drug dealer, or a CFO. That said, I don’t mind my tweedy brethren who emulate that splendid friend of the planet, the Prince of Wales, by wearing a signet ring on their diminutive digit. This practice is especially acceptable if one has some sealing wax and a Zippo lighter in his pocket to authenticate and secure one’s correspondence. Diamonds are not a gentleman’s best friend. 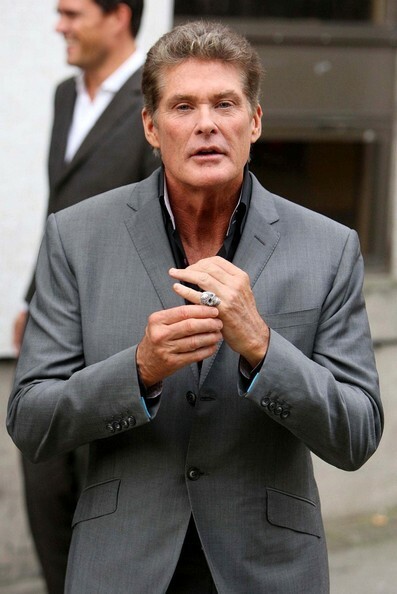 The pinkie ring: Not even The Hoff can pull it off. This entry was posted in Sports & Leisure and tagged GQ, pinkie ring. Bookmark the permalink.